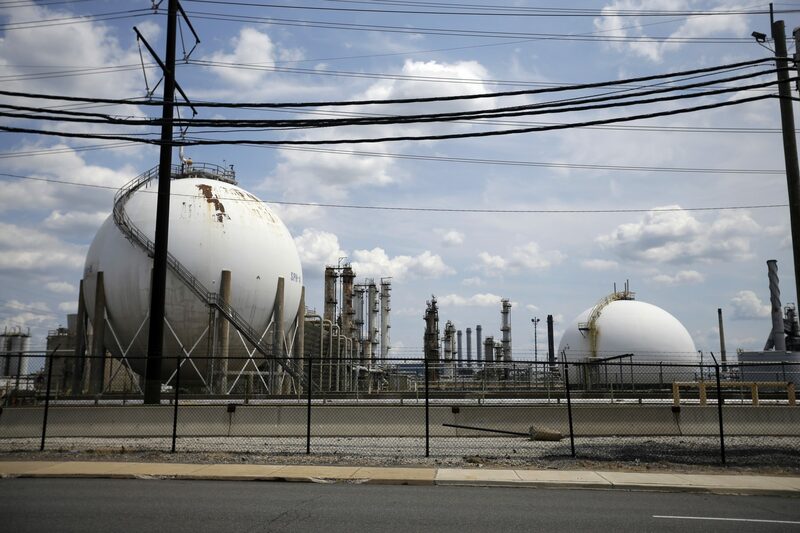 This photo taken on July 11, 2012, shows the Marcus Hook Refinery in Marcus Hook, Pa. The facility, which is owned and operated by Sunoco Logistics, is an international hub for natural gas liquidspropane, ethane, and butanefrom the Marcellus Shale region of Western Pennsylvania. Sunoco Logistics is spending roughly $2.5 billion on the Mariner East projects, which will connect the western part of the state to the port at Marcus Hook. The Environmental Hearing Board, which hears appeals against DEP actions, said in a ruling on Wednesday that the DEP was wrong to treat sections of the plant as separate entities when assessing their emissions, and should have evaluated the plant as a whole. And it said Sunoco appeared to have applied for the air permits for different parts of the plant rather than in aggregate in an attempt to avoid two sets of emissions regulations that would have been triggered if the operation had been considered as a whole. The regulations are known as PSD, or Prevention of Significant Deterioration, and NSR, or New Source Review. “There is some evidence of record to show that Sunoco had a plan to develop its facility in such a way as to deliberately avoid triggering PSD/NSR requirements,” Judge Bernard Labuskes wrote in a 78-page opinion for all five EHB judges. He called the application a “deliberately evasive plan” and said there was clear evidence that Sunoco intended to combine all of the facilities for which it had separately submitted air-permit applications. “There is no question that Sunoco did have a plan to make all the adjustments necessary to turn the Marcus Hook facility into a comprehensive NGL hub,” he wrote. Shader said DEP officials are reviewing the ruling and have not decided whether to appeal to the Commonwealth Court. The plant is the eastern terminus for the Mariner East pipelines, a multibillion-dollar project that carries ethane, propane and butane some 350 miles from Ohio and western Pennsylvania. The latest phase of the project, a string of different-diameter pipes that the company now calls Mariner East 2, began operating on Dec. 29 after many delays because of technical problems and regulatory shutdowns over the last two years. The complaint was brought to the EHB by the environmental group Clean Air Council, which argued that aggregation of the Marcus Hook facilities would have triggered emissions-reduction requirements under the two regulations. The Council urged the court to revoke approval for one new part of the Marcus Hook complex known as Plan E on the grounds that the DEP’s errors were so serious that construction should be halted until a new analysis can be done. Both the DEP and Sunoco argued that any re-evaluation would reach the same conclusions, the ruling said. The judge denied the Council’s request, saying it had not convinced the court that the DEP and Sunoco were wrong in saying that a new analysis would make no difference. Sunoco spokeswoman Lisa Dillinger said the DEP was correct in issuing the permits but the company will provide the DEP with the information it needs for its review. Alex Bomstein, an attorney for Clean Air Council, said in an interview that the DEP has the power to shut down parts of the Marcus Hook operation while it takes another look at the case, as ordered by the EHB. Bomstein said the ruling is the first by the EHB to say that DEP acted unlawfully by failing to aggregate air permits, and so will set a precedent for other projects. In a statement, the Council welcomed the ruling as a victory for public health and for its own fight against the Mariner East pipeline project. “Too often, big industry players have avoided pollution controls by creating loopholes that jeopardize air quality protections,” said Joe Minott, the group’s executive director and chief counsel. He said the ruling closed a loophole that had often been used by Sunoco. The Pennsylvania Energy Infrastructure Alliance, which advocates for Mariner East and other pipelines, said that even though emissions from the plant are now subject to review, they are much lower than when the site housed a refinery. “Even with the EHB decision and further review, this is still an environment success story,” said Kurt Knaus, a spokesman for the alliance.